Is it just me, or does this seem a bit… conservative? As always, no judgments are laid upon a mere trailer, but a lot of the thematic elements in this clip – the elitist exclusive society, the nigh-magical city hidden from the common world via fantastic technology, a hulking mechanical monster, the young girl in need of rescue, the haunting sensation we get from a dangerous place redolent of naiive American protoculture – seem terribly familiar. I’m willing to cop that these are themes that have been explored in pop literature for some time. Still, I would have been more excited to see the creative folks at Irrational pop out something that suggested a bit more reach outside of their comfort zone. Irrational Games, nee 2K Boston, nee Looking Glass Studios, has a half-hour monthly podcast called Irrational Behavior. It consists of five to seven very short interview segments with various employees of the studio, not least among them Irrational impresario Ken Levine. As these are people who’ve had long careers at some of the more creative game studios around, their stories are uniformly interesting and frequently delivered with more than a little flair. The whole thing is nicely produced, with plenty of musical bumpers and narration by GFW/EGM alumnus Shawn Elliott to tie it all together. Podcasts can be stuffed with filler or too topical to retain value in the future. At their worst, podcasts are little more than torrents of consciousness; unfiltered, meandering, and ultimately frustrating. Irrational Behavior avoids all of these traps, although probably at the cost of a more rapid publication schedule. The cast is slick, to the point, and satisfying. It is, of course, marketing, but it is also entertaining, and as long as you bear in mind what it is you are listening to, the fun can be safely sluiced out of the propaganda via various mechanisms within your brain. You can find Irrational Behavior on the iTunes store, or get all of the episodes from the Irrational Games website here. Bioshock, complete. I saved all of the Little Sisters and got the “Family” ending. So nice, so pretty. Do I go back and slaughter them wholesale to see the alternate ending? Probably not, Bioshock 2 awaits! For your amazingly belated second voting opportunity, you’ll be choosing whether I finish Shadow of the Colossus or Bioshock. 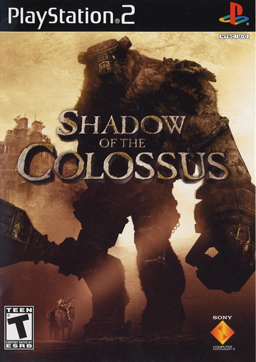 Shadow of the Colossus (hereafter Shadow or SotC) was released in America and Japan in October of 2005 for the PlayStation 2. It was created by Team Ico, the developer responsible for the cult game of a similar name, and published as a first-party release by Sony. SotC itself is essentially a series of boss battles broken up by travel across a vacant landscape; the player seeks out the colossi and must then use the environment and his own ability to climb on the giant enemies in order to scale them and attack their vulnerable points. The game is noted for its mournful atmophere, lack of enemies outside of the sixteen eponymous colossi, and musical score. And yes, I’ve made sure my PS2 still works. 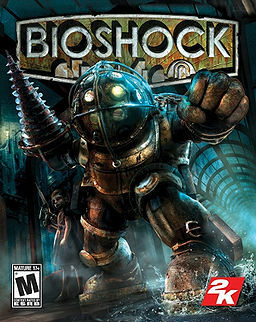 Bioshock was released in August of 2007 by Irrational Games, previously best-known for the creepy space jaunt System Shock 2 and the Freedom Force series of tactical RPGs. Bioshock has been described as somewhere between a spiritual successor and an outright ripoff of System Shock 2. Gameplay is strictly in the first-person and consists of both combat and the exploration of a ruined underwater city. Fighting requires using guns as well as what are essentially magic powers such as telekinesis and elemental attacks. Bioshock’s story in particular has drawn a great deal of attention for its exploration of the philosophy of Ayn Rand as well as its deconstruction of various video gaming tropes. Your comment box is below. Go!